Moto G dominated 10,000 INR – 15,000 INR market for most of this year until the arrival of Xiaomi Mi3. Motorola has now refreshed its best selling Moto G recently and the new Moto G brings adds some features on public demand, while reducing the price simultaneously. 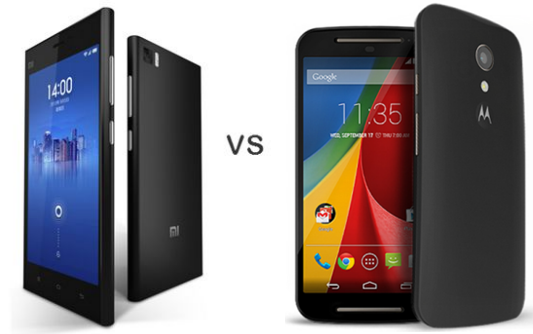 Let’s see how the refreshed Moto G stacks against Xiaomi Mi3. The Moto G comes with a 5 inch 720p HD display with great viewing angles, colors and brightness. The Xiaomi Mi3 on the other hand also comes with an IPS LCD display with more pixel full HD resolution. Both displays are very fine in quality and protected by Gorilla Glass 3, but Xiaomi Mi3 is sharper. Xiaomi Mi3 employs the prowess of 2.3 GHz Snapdragon 800 quad core (Krait -400 cores), one of the most powerful chipset these days which definitely overshadows Moto G’s Snapdragon 400 quad core clocked at 1.2 GHz with Cortex A7 cores. Xiaomi Mi3 leads by a margin and has double 2 GB RAM for efficient multi tasking. UI transition and day to day usage is smooth on both handsets. Xiaomi Mi3 comes with a 13 MP rear camera capable of recording 1080p videos, while Moto G features an 8 MP shooter with 720p Video recording capability, which can be considered above average (based on our initial testing). Based on our time with both devices, Xiaomi Mi3 takes a lead in Imaging department. This time, Moto G has option for MicroSD card expansion up to 32 GB besides 16 GB of native storage. Xiaomi Mi3 on the other hand features non expandable 16 GB which won’t be very appealing to heavy users. Xiaomi Mi3 comes with a massive 3050 mAh battery as against Moto G with 2070 mAh battery. Its too soon to comment on Moto G battery backup yet, but Xiaomi houses a bigger battery which is expected to last longer. Xiaomi Mi3 runs on Kitkat based MIUI ROM, which is rich in features with several customization option and vast community support. Moto G on the other flaunts the latest Android OS with guaranteed update to upcoming Android L. Xiaomi Mi3 has speakers placed at the bottom edge while Moto G has dual frontal speakers at the front for clear and loud audio. Xiaomi Mi3 has better camera, sharper display and bigger battery, while Moto G comes with MicroSD card support, good quality IPS LCD display, well optimized hardware and software and is slightly cheaper. While the price difference won’t make much of a difference, availability will. The sales of Mi3 have been suspended temporarily, and even if it starts retailing again, it will still be very hard to buy one from flash sales.